The application of ICT in agriculture has the potential to completely transform Ireland’s already significant role in global food production, tech experts say. There is a growing movement in agriculture to apply information technologies in order to improve practice efficiencies and yields. Waterford Institute of Technology’s Telecommunications, Software and Systems Group (TSSG) is linking up with EU Commissioner, Phil Hogan, Teagasc, Glanbia, Keenans and other farming organisations, CEOs and all those who want to get involved in EU funding for ICT-agri technology. The landmark effort to generate industry-wide support for a national strategy encouraging the research and development of real and appropriate ICT solutions for the agri-industry as a whole follows hot on the heels of the TSSG’s ‘Agriculture Think Tank’ at the same venue in February. EU Commissioner, Phil Hogan spoke about the global reach of ICT in Agriculture by saying “ICT technologies are changing the shape of the agriculture industry across the globe providing improvements in the quality of production of crops, the health of livestock and the quality of life for farmers. Additionally, there has been a dramatic increase in emphasis on consumer protection, continuous quality assurance, natural foods, pathogen-free food, reduction in the use of veterinary treatment and increase concern for care of animals. He went on to say, “The Internet through its rapid evolution offers enormous opportunities for the agriculture sector globally. Ireland can lead the way in this new revolution and this conference does that, by beginning the conversation while putting concrete research plans and ideations into place and engaging the key stakeholders”. 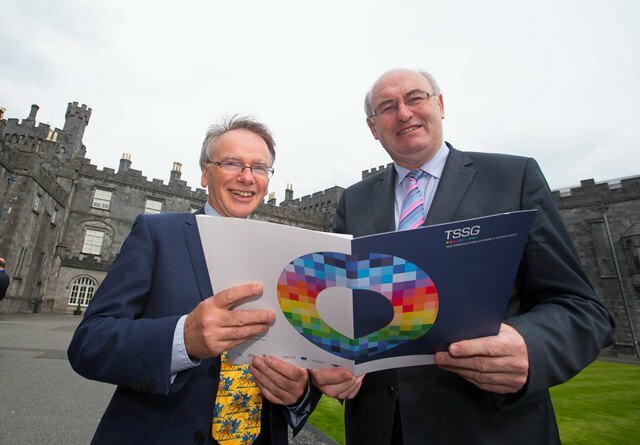 By bringing together people from both the Agricultural and ICT industries common opportunities can be identified and the potential captured as a national strategy geared towards developing an export focused ICT-Agriculture industry, WIT President and TSSG Founder & Director, Prof Willie Donnelly said. Agriculture Commissioner Phil Hogan opened the event which Prof Donnelly hopes could be a turning point for Irish agriculture into the future. “The Agriculture industry is the backbone of the Irish economy and the export potential is massive. We hope to influence policy in Agriculture in order for ICT to take a more active role in the industry. “We are working with our existing partners to develop new relationships to address recognised and agreed issues within the Agricultural supply chain by applying established ICT solutions. From an earlier ‘ICT-Agri Think Tank’ held in February delegates admitted that while ICT systems are deployed to a degree within the Irish agricultural industry, existing implementations are siloed. “ICT is embedded everywhere – with machinery and equipment becoming ‘smarter’ and better ‘connected’. This has resulted in the production of large volumes of data which, if harnessed correctly, can support better decision-making at all points in the agri industry chain. “The key emerging challenge is how to integrate and make sense of a diverse range of data sources, and channel this into a usable form that delivers increased efficiencies and supports increased levels of sustainable production. The Irish agricultural sector can gain substantial competitive advantage by harnessing our newest resource- data. The overall concept of using ICT for Agriculture has become known as Precision Farming and/or Agriculture. It is Precision Agriculture that can drive future economic growth in the sector. This will create two complementary industries: sustainable food production and ICT-agri technology. Becoming a leading exporter of such expertise holds huge economic potential for Ireland and the wider community of Europe.